Spotlight your BRAND Today † with Business hosting!! - Starts Just @ € 19.99** /mo. Start With Us! Completely Risk Free with Our Anytime MoneyBack Guarantee*!!! ** Monthly prices reflected when buying a 12 month contract (other contract terms available)..
*** FREE Domain and FREE COMODO Positive SSL available on only Annual Subscriptions. †Discounts are applicable on Annual Subscription. Web Hosting For E-commerce web hosting. ScopeHosts Enterprise Based Business Hosting plans are Suitable to meet all type of Business Standards. An Easy-to-use cPanel eliminates the complexity and boosts the website performance to a level higher. Take full control over your online establishment with our Flexible Business Hosting solutions included free, or transfer your own existing eCommerce website. Simple Migration and One-click Upgrade gets your venture online within a blink. Business Hosting is perfect to host Ecommerce websites, HD image-heavy and video streaming websites, Business Listings and Social Media Sites. Choose the most suitable plan to get website hosted efficiently. ScopeHosts has made managing of high-powered websites easier and efficient via best solutions and expert support. Business Hosting Spotlight to Empower Your Digital Identity. SSL certificate for Secured Transactions. Ease to control High Traffic. CloudFlare CDN to Accelerate Website Performance. HostAdvice compares us with some of the prominent hosting providers. Custom-built Solutions to have Powerful Online Presence. ScopeHosts provides world-class customer service driven by Leading Edge Technology. Our ever growing 28,000+ world-wide clients have chosen our Business Hosting for their Online Presence Growth. Our Enterprise Servers and hardwares will keep your website function unceasingly. Your website is up and running with our Business Hosting. Enjoy enterprise based spam protection with our every business hosting plan. Now say no to spam & get proper filtered mails to your inbox. ScopeHosts understands importance of your work, your support tickets are high priority for us. Have no worries regarding your technical issues. Potential Security Protection at Pinnacle!! Get Best-In-Class Business Hosting Features to keep your Online Venture Protected. Properly installed and configured dedicated firewall, an extra barrier on top of other security measures, deployed on the server to protect your website from major attacks. We have Malware Scanner, which scans files, folders and mails regularly to keep your website away from malicious attacks and provides real-time protection. All premium CMS applications like Wordpress, Joomla, Magento, Drupal and lot more are automatically updated with latest security patches to keep your data safe. Our servers are secured with DDOS protected network, filters out the unwanted traffic & sends true traffic to website. We secure your website via best DDOS Defense Solution. Antivirus is handy tool cleaning all the website related files and folders with latest security threats to safeguard your data and also to amp up your website performance. Most preferred control panel, cpanel access is been provided to host the website. Easy-to-use control panel access eases the management of your website. Register a domain or transfer domain for free and free comodo SSL is provided with Business Hosting Plans on annual subscription. Choose the Plan that includes everything to have a strong online presence. 1. What is Business Hosting? Ans : Business Hosting is dedicated towards online enterprises, which requires lot of server resources than normal web hosting. With customer requirements analysis, we got clear on you and your customers need fast, easy-to-use and the best web hosting for small business. ScopeHosts Business Web Hosting Solution delivers high power and optimum performance as a VPS without needing for server administration. Lesser users hosted on server with dedicated resources like RAM, CPU and bandwidth. 2. What major benefits are included with Business Hosting ? 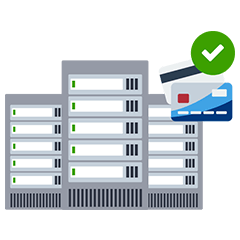 Ans : Fast - All the servers are configured with Enterprise SSD`s on RAID10 hardware controller performing 20X faster, which loads your database driven website fast. You will have dedicated resources, your website will not be affected with other websites hosted on server. Easy-To-Use - You will get easy-to-use cPanel control panel access, where you will not be needing to hire any IT server administrator to manage Business Hosting. Reliability - ScopeHosts provides Hassle-free Business Hosting Solution with dedicated resources and easy-to-use control panel, we also provide 24/7 Pro-active Support through Live Chat and Support Ticket System. A Complete Package boosting your online enterprise growth! 3. In which location Business Hosting is located ? Ans : We provide Business Web Hosting service in World-Class TIER III+ Evoswitch Datacenter located at Amsterdam, Netherlands. The TIER III+ Evoswitch datacenter offers the best in security, sustainability and connectivity with support engineers available 24/7 performing regular maintainance activities. 4. How many Websites can I host with this service ? Ans : Depends on the Plans Chosen, You will be able to host 2 Websites in BH-Mini, 5 Websites in BH-Pro, BH-Enterprise is available to host around 10 Websites and Host Unlimited low traffic Websites on BH-Pro. Choose the most perfect plan to host your website. 5. Does Business Hosting come with SSD`s Space ? Ans : Yes, We have Enterprise SSD`s mounted on Hardware RAID-10 Controller give optimum best results for your website pages to load 20x Faster than normal HDD`s. All the plans of this service include SSDs making your website load at faster pace and boost your website performance compared to the traditional disk drives. 6. Is moneyback guaranteed if I am not satisfied with this service ? Ans : Be Risk-free with our service, as we offer anytime moneyback guarantee without any hassles. Service cancellation request made within the first 30days of the subscription will yield you full refund. 7. Is assistance provided to recover lost backup, website files and data ? Ans : We will surely help you in recovering your website files and data. Our off-site backup servers store daily backups, weekly backups and monthly backups. A set of 4 backup`s is stored within our off-site backup servers. You can request for offsite auto backup whenever required and you can have your data backup as soon as the payment is received. 8. How can I upgrade to Business Hosting from shared hosting if my business outgrows ? Ans : If you are a existing customer of ScopeHosts, then upgrading to business hosting is a cake walk and upgradation can be done in a single click. Your website’s files would be automatically be migrated without any extra work on your part regarding uninstalling and reinstalling of any files. ScopeHosts has simplified the process of upgrading to a more powerful plan with one-click. For more clear idea on upgrading to higher plan or poweful hosting service you can contact our sales team. Email us at sales@scopehosts.com. 9. Is free domain registration provided with Business Hosting ? Ans : Yes, Free domain registration for life time is provided with all the plans of this service. Get started with unique domain for your online enterprise.